Featuring interviews with screenwriting luminaries James L. Brooks, Nora Ephron, Carrie Fisher, and Gary Ross. 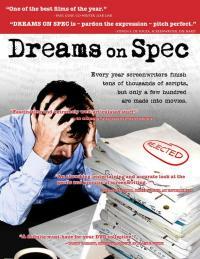 DREAMS ON SPEC follows three aspiring Hollywood writers as they pour their hearts into their spec(ulative) scrips, pitch their ideas to anyone who will listen, go to meetings, hold table reads, and work at low-level day-jobs - all in the hopes of one day seeing one of their beloved creations made into a movie. This documentary offers a funny and compelling look at inspiration, creativity,and solitude in Hollywood.